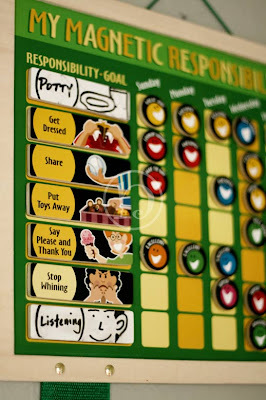 We have started implementing the responsibility system with Thomas. At the end of each day we review the chart and Thomas gets a magnet for everything he has managed to do well that day like saying please and thank-you and putting his toys away. As you can see, we added a couple of extras that we deem important enough to track. It seems to be working, at least for some things, although sadly we’re still working on the potty one. Sigh!